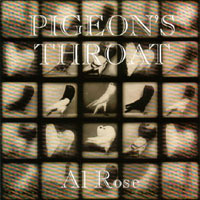 On his third release, Pigeon's Throat, Al Rose was again working with his band, The Transcendos, who provided the fascinating sound that won critical raves on his second album, Naked In A Trailer. These eleven songs range from the re-written history of "Lincoln," the breezy feel of "Lighter Than A Feather," the rollicking "Ripe Unacceptable Now," the sound-noir of "Polish My Car" and an emotional ballad that sounds timeless upon the first listen, "Patience." The Transcendos included drummer Heath Chappell, bassist Steve Hashimoto, guitarists Victor Sanders and Maury Smith, and vocalist Laura Blye. Al is the center of the ensemble on acoustic and electric guitars with solo turns on harmonica and flute. Additional musicians were organist Carter Luke (now a Transcendo fixture), mandolinist Stuart Rosenberg, violinist Steve Gibons and cellist Diana Parmeter. Al's musical soul rose early. Studying flute from 4th grade until losing interest in high school, he picked up an old guitar collecting dust in the basement and became obsessed, not as a guitarist, but as a songwriter and singer. Soon came the college coffeehouse gigs and rock bands including a critical and personally satisfying stint as co-leader of Chicago based Buffalo Trout. With fevered pitch and hearty focus, Rose formed The Transcendos: his true point of embarkation. Flexibly powerful, from dada gospel to caffeinated pick; explosive rhythm to sparest hush; swampy improv groove to country shine, the 'Cendos nail them to the wall. The songs bloomed with Rose's stream of metaphor lyrics connecting our disjointed artifacts of life. A slice of life in a traffic jam. Raindrops on the basil baked on the setting sun with a slow low rise style. His word sculptures enlighten the random moment telescoping and microscoping a personal sky where the knives wait to cut and eyes adjust to the dark, open wide. Rose has always approached the recording process by serving the song and, working with gifted co-producer and engineer Blaise Barton, Al has released four stunning discs: Information Overload (1994), Naked In A Trailer (1996), Pigeon's Throat (2000), and Gravity Of Crow (2003). Each stands alone. In series they expose Al's evolving habit of craft. It's so easy to hear the time and care, the patience and skill, the garlic and wine that went into the work. Listen. Al's wild ride spontaneous live shows, whether solo, full band, or configuration in between, coast and roll you inside out. You know the way a surprisingly loud crackly fire manages to give off a warm, steady glow? Yeah. Make sure to check out Al Rose's latest release, 2003's Gravity Of Crow right here at CDBABY. Also available from CDBABY is Naked In A Trailer (1996) and Information Overload (1994).